Local Students Win BIG in St. Louis! On April 26th, 2014, Kuk Sool Won™ of Burton, Michigan participated in the World Kuk Sool Association (WKSA) Midwest Championships. This tournament was held at the University of Missouri St. Louis and was quite an impressive event. A total of 534 competitors from around the country traveled to participate in this tournament. Local Kuk Sool Won™ Martial Art Center (5515 Davison Rd. Burton) took 20 students to try their best in the competition. Each of the students performed well and made their school proud. After the tournament, the WKSA ended the night with the Masters Demonstration / Award Ceremony. During the Award Ceremony the Grandmaster of Kuk Sool Won™ (Suh, In Hyuk) gave recognition to several individuals and schools for their hard work. 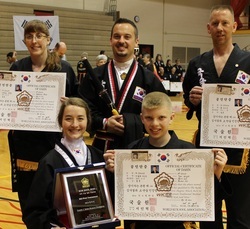 He presented Stephanie Frank (of Burton), Paul Wright (Grand Blanc) & Tyler Wright (Grand Blanc) with their Black Belts! This was no easy task involving over 4 years of training and more than 10 grueling black belt tests. Then Mariah Guye-Wright (Davison, MI) was presented with a plaque recognizing her as the Champion of her division! After the individual awards were given out, they announced the placement of each school. The local Burton school was placed 5th overall against over 25 schools! The Grandmaster presented the Head Instructor/Owner Kenneth Wright with a sword to honor his work with the students.